Sadly, we have to start off this update with the news of the loss of a much-admired Old Collegian and a family member of our club. Last Sunday, Michael (Mick) Curran, father to current player and board member Jack Curran, passed away suddenly. The club wishes to pass on our support and sympathy to Jack, Brigid, Caitlin and Louise at this sad time. It is with much sadness that the M.O.C.F.C. 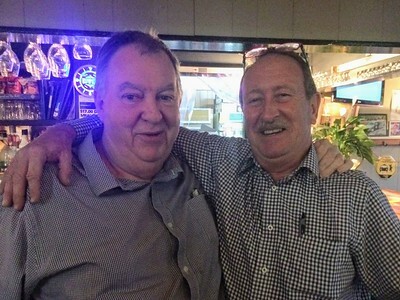 Community farewells one of its staunchest supporters. As a dashing,strong and fearsome player Leo played for the Old Collegians whilst still a schoolboy in 1970 when the club was in the Y.C.W. competition. Leo then played with the Old Collegians when it entered the Amateurs and because of family commitments in running the well known and much loved Lord Raglan Hotel in Richmond his on field contribution ceased prematurely in 1973. In ensuring years the number 25 was an avid supporter and contributor to the club and was prominent in organising and attending numerous social functions. One such event was supplying a nine gallon keg for the use of a lucky private table at the M.O.C. annual ball at the Kew Town Hall. After working stints in W.A. and N.T. Leo returned as an active participant in the club in 1995 when he was elected president in absentia! (Don't be late for an AGM at Eagle Land!). His tireless work during his three year presidency saw the Club finally elevate from C Section with a well earned Premiership, laying the foundation for the 2001 A Grade success. Leo stoically battled ill health for the past seven years and has finally succumbed and is no longer suffering. Leo is remembered as a good bloke, a generous soul and someone who was loved by all. Funeral Mass to Celebrate the Life of Mr. Leo Joseph Kearney will be offered at St Mary's Catholic Church, cnr of Rossmoyne and High Streets, Thornbury on MONDAY (November 27th, 2017) at 2:30 pm. The players have returned from a well-earned break and are eager to build on the successful 2017 season. They have hit the track running for pre-season training in the last week and it is fantastic to see lots of old faces as well as all the new recruits. We especially welcome our new Under 19s and Sheagles players, who represent the future of our club. We hope you are in for some exciting times both on and off the field. It will be an exciting time to be at the club in 2018 as we celebrate our 50th year. So don't miss out and make sure you are part of this special year. Board Members have all been busy behind the scenes preparing for the new season. A big welcome to our new board members. Thank you to Matt Beayni, David Beaini, Chris Dimattina and Rob Costanzo who have retired from the board this year for all their hard work and commitment to the club. Anyone wishing to be involved at the club, in any capacity, the football department, player, sponsorship or volunteer, please contact us at admin@marcellinocfc.com.au or myself on president@marcellinocfc.com.au. Preparations for our 50th year celebrations are well under way with lots of different events and opportunities to be happening at the club. We will keep you informed as we lock in all the details. Gala Dinner July 14th is confirmed so put it in the diary. We also hope to have a luncheon on April 21st, we are just waiting on confirmation of the 2018 fixture.